Bell’s flagship beer is Two Hearted Ale, an American style IPA that is unique in that it only uses Centennial hops. Less bitter than West Coast Style IPAs such as Green Flash, Two Hearted is hoppy but balanced, very drinkable. The beer was released commercially in 2000, at a time when a 7% dry hopped IPA was not a common beer. It quickly became the standard that many others tried to emulate when brewing a great American IPA. For many beer lovers this is the first hoppy beer (let alone the first IPA) that they ever tasted, the drink that pulled them into the world of craft beer. It is considered a truly historic beer by many. 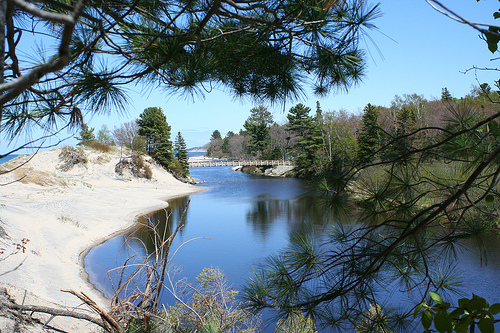 The name and label are rumoured to have come from the Two Hearted River in northern Michigan (home of Bell's Brewery) which is a popular destination for recreational fishing, featured in the story “Big Two-Hearted River" by Ernest Hemingway. 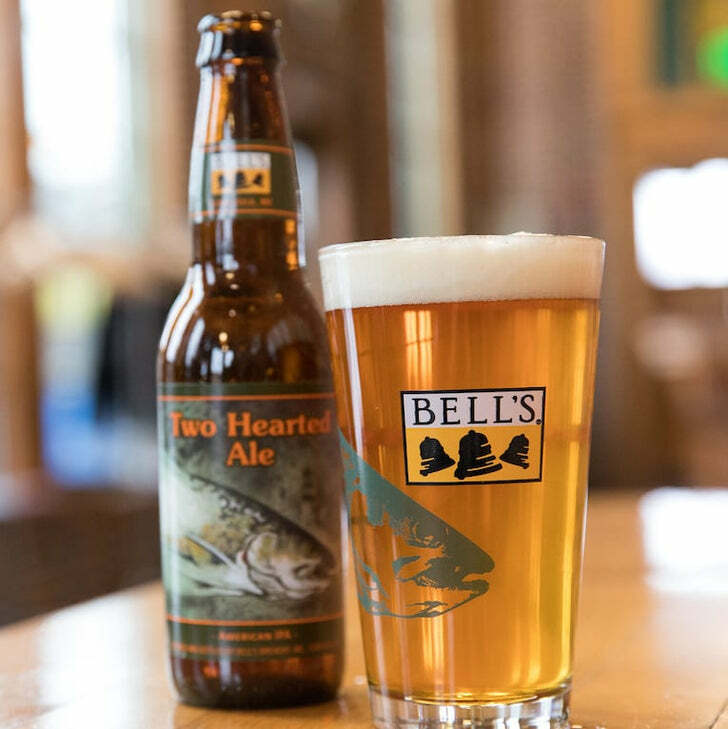 According to a quote from Laura Bell (daughter of the brewery's founder Larry Bell) however, early 1990's Two Hearted recipe experiments used a combination of English malt and American hops, hence the name "Two Hearted". The recipe changed, the name stuck. Despite the odd label it is an extremely popular beer that has been ranked as the #2 beer in America for many years in a row now by the American Homebrewers Association's Zymurgy magazine. (Pliny the Elder seems to be have the #1 spot locked for good). The malt bill uses mostly 2-row, Vienna for some graininess, and just a bit of caramel/crystal 15-20L to add a touch of sweetness and colour. The hop bill is extremely straight forward with only Centennial from start to end. Bell's is said to use a proprietary (in-house) yeast strain but if you follow the various brewing forums you'll find that many (including some who helped with the initial setup of the brewery) have indicated that their in-house strain is actually Wyeast 1272 American Ale II. This yeast produces more fruity notes and is more flocculent than Fermentis Safale US-05 / Wyeast 1056 American Ale / White Labs WLP-001 California Ale that we use for many of our other American style hop-forward beers. 1.25 qt/lb mash thickness. Single infusion mash at 150F for 90 mins. Mashout to 168F. Think I am going to brew this one this weekend if my Honey-Dos allow me. Have some friends wanting some hoppy beers. Wow! I made 10 gals of this Two Hearted and split the batch with WYEAST 1272 and Harvested Two Hearted yeast. Two Hearted is my favorite beer that I don't brew myself. However, this recipe negates any reason to "buy" Two Hearted ever again! Excellent clone. Now excuse me ... I have some heavy drinking to do. Pick up some from time to time anyway to thank them for their wonderful beer - if breweries didn't make stuff like this, we wouldn't be making this hoppy IPA today! I'll always support Bell's. I met my wife in Kalamazoo! on this recipe? I've seen the recipe all over the Web but the hop schedule seems really low. I usually drop at least 8 to 10 oz in my IPAs. "The bottle features a picture of a rainbow trout which strikes most people as odd when you first see it. Someone perusing the aisles at their favorite beer store is liable to think that this is some strange marketing attempt at making a fish flavored beer. I sometimes wonder how much more they would have sold (if any) had the label been different..."
This is no doubt a function of a regional beer gaining national recognition. I lived in the UP and Northern Lower for ~14 years. Understood what this referred to instantly. Great beer. Thanks for the recipe Kal! I made this and I'm not a huge IPA fan. I'm more a stout and Belgian fan. Either way, this was an easy recipe and I thought this was BETTER than the store bought Two Hearted Ale. 10 gallons only made it 4 weeks without any major gatherings at my house. Not one person didn't like this beer. Glad to hear the beer turned out well Fal! It's definitely a classic (and a simple one to brew at that). I've never gone through a 5 gal batch so quickly (mostly by myself). This is one of my new favorites. It's so well-balanced, even my non-IPA drinking friends enjoyed this one. for the 2 oz dry hop, is that 2 oz total, as in 1 oz in each carboy? or is it 2 oz in each carboy (4 oz total)? All ingredients are for the total batch size (12 gallons). How you split up your wort for fermentation/conditioning is completely up to you and I don't make any assumptions around that as everyone brews differently. most of the other two-hearted recipes i have seen call for doubly that hop quantity for dry hopping. i assume yours is good with the 2 oz? ever tried/thought about dry hopping with more? most of the other two-hearted recipes i have seen call for doubly that hop quantity for dry hopping. Do you have any links to these recipes? I'd like to see them. i assume yours is good with the 2 oz? ever tried/thought about dry hopping with more? Yes. Very good. Like the commercial version. Never found the need for more. above is from bell's brewers, from zymurgy. scaling to ten gallon, they dry hop with over three times as much as your recipe but also have way less hops in the boil. I remember those recipes. I remember doing a lot of research into the different ones available and disregarding those as not entirely correct. Unfortunately I don't remember the reasons, but it often has to do with scaling from production levels to smaller homebrew levels and how things work differently. Moving late addition hops to dry hopping is often one thing that's done as late additions in the giant commercial setups tend to keep boiling for 30-60 mins longer than at home given the thermal mass of the setup. I suggest brewing both and seeing which you prefer! oh for sure. i suspect the beers will be good either way, just comes down to preferences. i already have a batch fermenting in two carboys right now, maybe i'll hop with one ounce in one of them (to match your recipe) and then put, say, 2 oz in the other carboy. Having my first success in 246,736 attempts this week I'm ready to go again! For the starter, I've got the 2L Erlenmeyer and stir plate...how many smack-packs/vials should I go with? ?